Knowing your audience, communicating clearly, and making the process easy will convince customers - or in this case me - to buy. 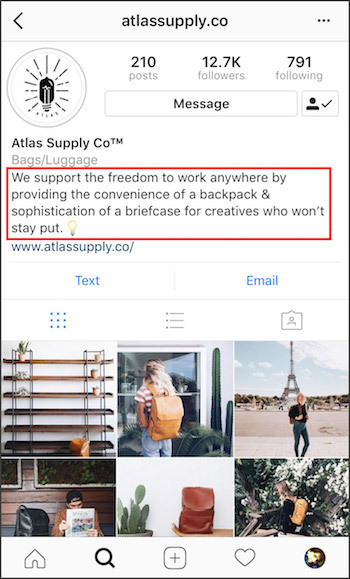 The copy on Atlas Supply Co's Instagram profile was almost all I needed to convince me to purchase this bag: "We support the freedom to work anywhere by providing the convenience of a backpack & sophistication of a briefcase for creatives who won't stay put." This was what I had been looking for. This brand was speaking directly to me. When I started my first grownup job where I needed to carry a laptop with me, I bought a fake leather work purse thing that came with a laptop sleeve. I carry too many books and papers, so it became heavy and painful to lug around. I wanted my hands free, and I wanted to distribute the weight on my back instead of one shoulder. So I removed the laptop sleeve and added it to my trusty backpack. That backpack/laptop sleeve combo became my bag of choice as I traveled the country and worked remotely. It didn't look great, but it was convenient and reliable. Since I've been working for 8+ years, I figured it was time to find a bag that would fit in a professional setting instead of a classroom. But I still wanted something with some character and enough organization for me to comfortably carry my office on my back and with the potential to safely carry camera gear. I considered brands like Herschel, Peak Design, Timbuk2, This is Ground, and ONA. I googled "Women's professional backpack" and came up disappointed. Peak Design and Timbuk2 provide the organization I wanted but looked more like a commuter bag found in a big city. Lots of greys and black, but not the character I was wanting. I love big cities, but I don't live in one, and I wasn't looking for something that harkened to a techy, sci-fi vibe. But what I really wanted was a classic, leather bag with the great organization. ONA and This is Ground are beautiful options but came with uncomfortable price points. Now that I've set the scene on what I was looking for in a new bag, enter stage left the character of Atlas Supply Co. who wasn't even on my radar. So how did this new brand get me to purchase their bag after other major brands couldn't? And how can you apply this to your own brand? Your company's product or service isn't for everyone, nor should it try to be. Like people, companies have their own styles of working and communicating that will naturally fit better with certain audiences. Some people are Apple people and others are Android people. It's fine. Knowing your company's identify and who your audience is, is half the battle. The inventors of this bag, created it out of a need they experienced as entrepreneurs. This made it easier for them, because in essence they were their own audience. To target their audience, they needed to reverse engineer where they would spend time online and in person and advertise in those spaces. I found out about Atlas Supply Co because one of their bags was a giveaway at the Story Conference I attended in previous years. As I was following along with the conference's Instagram story this year, the conference showed the bag and linked to the Atlas Supply Co's Instagram profile which is how I discovered them. Atlas Supply Co. knew their audience and targeted an event that is popular among creative professionals. Glancing at the social activity of attendees, it's obvious they invest energy in Instagram, so it was a good choice for the conference to place the product and links in a place where the potential customers were spending time. In short, know where your audience spends time and be there. If knowing your company and audience is half the battle, being able to communicate who you are in a way that connects is the other half. Crafting simple statements that respond to a customer's problem is a fine art, but Atlas Supply Co. has done a nice job with this. 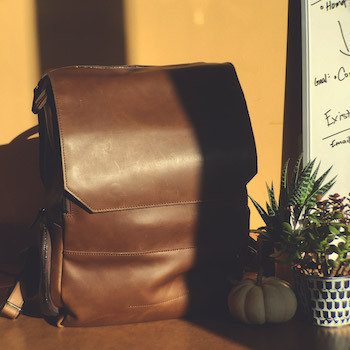 Their main statement: "We support the freedom to work anywhere by providing the convenience of a backpack & sophistication of a briefcase for creatives who won't stay put." Their main statement breaks off nicely into shorter statements used on their website and other collateral. "For creatives who won't stay put"
These statements could tout the strength and durability of their product or how it's created by entrepreneurs. But that's not the problem this bag is solving for their audience nor does their audience want to hear about how amazing the makers are. Their audience's problem is needing a sophisticated bag to keep up with the mobile office lifestyle. Any other language distracts the audience from solving their problem and becomes a barrier to the company's goal of having a customer purchase the product. Visuals are another form of communication and Atlas Supply Co's photography does a nice job of connecting with the target audience to show an untethered office. Images of the bag in various places from a hike in the woods to a refined office lobby reinforces the concept of mobility. Those images show the audience's problem being solved and encourage the audience to buy and complete the narrative. Once the audience is identified and clear communication is established, it's time to open the door for buying or achieving the goal a business wants their customers to complete. With a retail or ecommerce company, the end goal of buying is pretty obvious. Other companies with a higher price point product may need an intermediary goal to continue developing the relationship through email campaigns, setting up an appointment or making a phone call. There is navigation at the top of Atlas Supply Co's website, but as the viewer scrolls down the homepage, the only links direct to the shop. This makes it easy for the audience to buy, but it also eliminates distractions from the goal of buying. Atlas Supply Co's online shopping cart is easy and intuitive–similar to shopping on Amazon. They added the extra touch of free US shipping. I made my purchase on a Sunday night and received the customary emails notifying me that my order had been received. I was pleasantly surprised a short time later when I received a couple emails notifying me that my order had been processed and set up for delivery. The customer service was exemplary. When I tagged them in my own Instagram story after my bag arrived, they were quick to respond. So not only was the buying process simple, easy, and familiar, their customer service matched the attention to detail I had already experienced. From opening line to package delivery, this brand impressed me. They know who they are, they know who their audience is, they communicated directly to their audience, and they paid attention to every step of the online buying and delivery process. They earned my business, my admiration, and a fan. I believe all brands are capable of a similar process. Discover your audience and take care of them as you'd want to be taken care. If your brand's message needs to be refined, we can help you through our branding and content creation process.